I’m still in the noman’s land of those without internet. Looks like it’ll be anywhere from 3-6 more weeks. Trust me, I’m hating it more than anyone but it’s been a marvelous opportunity to get a lot of work done. I’ve read more books, edited more pages and actually buzzed around the house like a busy little cleaning bee more than ever before. Thankfully there’s still a mountain of things for me to do around here and a pile of books in my ‘to read’ list or I’d have to face the horrors of being cut off from the rest of the world in a more concrete way. The good news is that when all of this is over I should hopefully have “Toxic Ash” finished it’s first run of edits, though it remains to be seen if I can get it into final polish phase in time for me to hit publish as soon as I get back – but I’m sure as hells going to try. So bear with me readers! Since I’ve been reading so much – I have a ton of book reviews to hopefully tide anyone coming to the blog for updates over with. Sadly my facebook, twitter, pinterest etc are all going to have to wait for me to get back into full force (Ah, how I miss the random blather and pretty pictures!) bear with me everyone! 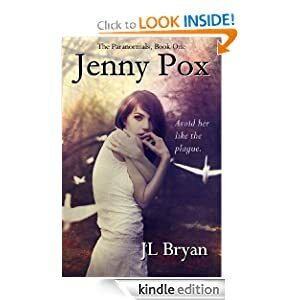 First up is J. L. Bryan’s “Jenny Pox,” a paranormal fantasy novel with a very different tone than the usual vampires and werebeast angle. I was super excited to read this one since I’m also an author of very unusual paranormal tales and it was really exciting to see what new ground someone else was exploring in the genre.